Bionic Bites has a really great post about all the mini meal options at Golden Krust, the Carribean chain with multiple midtown locations. 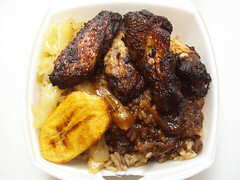 “All the options come with cooked cabbage, a slice of fried plantain, and a choice of rice or rice and peas. Prices are dependent on what you order, but everything hovers around $6.” Her favorite is the jerk chicken wings, but she also reports that the cow’s foot special and the curry chicken are good as well. Posted by Zach Brooks at 9:00 am, March 10th, 2009 under Golden Krust. Looks tasty but cabbage and beans and spicy food is a recipe for disaster with me! Why thank you, my dear friend “Fred” (not your real name I suspect).